Hi Everybody! I am so pleased and excited that Amy has picked me to host this week's Blogger Secret Ingredient Contest!!! I was totally blushing when I got her email this morning...! As a newbie to the blog scene I'm completely flattered that she chose me and hope that I can meet the expectations of all of you fantastic foodies out there! Recipes can be submitted by linking to my blog (http://bellaeats.wordpress.com) or e-mailing me bellaeats@gmail.com with a link to your recipe. I'd prefer an email, so I can easily keep track of all the entries! Even if you don't have a blog, you can definitely still participate! Just email me the recipe, the steps, and some photos and I will add it to the entry list. As you can see from the title of this post, I have picked GINGER as the BSI this week!!! This was really tough, because I had actually thought of an ingredient last week that I thought I would pick if I were ever chosen as BSI host. However, it wasn't conducive to baking and I really wanted an ingredient that could be either sweet or savory...so ginger it is! UPDATE: Ok, I have a full stomach and a happy hubby so I can now provide you all with a bit more information about ginger. Fresh ginger should be peeled before cooking. Keep fresh ginger wrapped in a paper towel and placed in a plastic bag. It can be kept in the fridge for about 3 weeks or the freezer for about 3 months. Fresh ginger can be substituted for ground at a ratio of 6 parts fresh to 1 part ground. Fresh ginger and ginger juice is often used as a spice in Indian and Chinese cuisine, especially with savory dishes such as fish. Pickled ginger is common in Japanese cuisine. 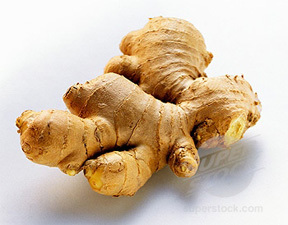 In the Caribbean, ginger is a popular spice for cooking and also for making drinks such as sorrel and ginger beer. 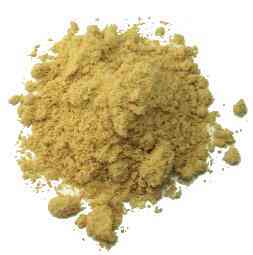 Powdered ginger root is typically used to spice gingerbread and other baked goods. 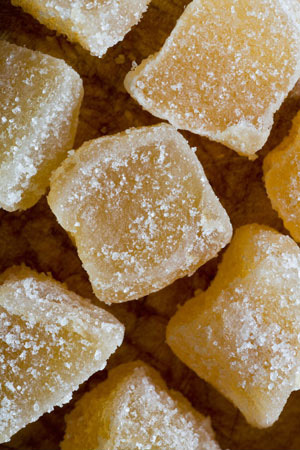 Candied (crystalized) ginger can be used as flavoring in cookies, crackers and cake, an is also the main flavor in ginger ale. Ginger root has many medicinal properties, including helping to cure nausea, diarrhea, sore throats and headaches. I've had an amazing crystalized ginger and pear juice martini before...heaven!!! I hope you all have fun with this week's BSI choice! I can't wait to see all of the entries you come up with...ginger is such a versatile ingredient that I really think you can get creative with it!! !